Dental implants are permanent and comfortable replacements for missing teeth. They are artificial roots and crowns that are placed into the upper or lower jawbone to replace missing teeth. Browse our dental implant pages, or read below about dental implants in general. An excellent option for permanent tooth replacement for anyone with healthy bone structure. Even when there is bone loss, Periodontists can regenerate bone through bone grafting, thereby creating structure for implant placement. Suitable for adult patients of any age. With good oral hygiene habits, dental implants are designed to last a lifetime. Toronto periodontist Dr. Jill Levine is dedicated to helping patients feel confident and comfortable with their smiles. 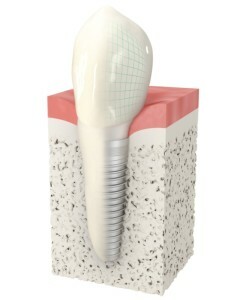 Implant placement involves several steps. After a thorough evaluation of your current oral health and medical history, Dr. Levine will determine whether you are a good candidate for dental implants. Under local anaesthetic, a threaded titanium post will be placed into your jawbone through a small incision in the gums. Over the next few months, your bone will grow and attach itself to the implant through a process known as osseointegration. 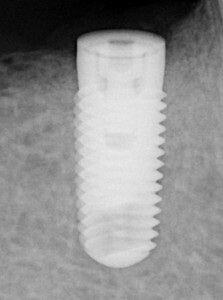 When the implant is fully secure, an opening will be created in order to place a connector, called an abutment, which enables your restoring dentist to place a crown. Your restoring dentist will take an impression of the area to create a crown and shortly afterwards the final crown can be placed.